24 December 2006: A Happy New Year! 22 December 2006: Today, an agreement was signed in Prague between ESO and the Czech Republic, aiming to make the latter become a full member of ESO as of 1 January 2007. 22 December 2006: On the night of 15 December 2006, the fourth and last-to-be-installed VLTI Auxiliary Telescope (AT4) obtained its 'First Light'. The first images demonstrate that AT4 will be able to deliver the excellent image quality already delivered by the first three ATs. It will soon join its siblings to perform routinely interferometric measurements. 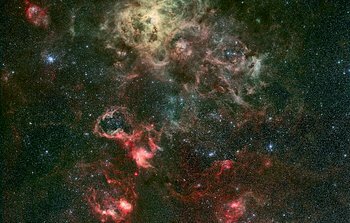 21 December 2006: A new, stunning image of the cosmic spider, the Tarantula Nebula and its surroundings, finally pays tribute to this amazing, vast and intricately sculpted web of stars and gas. 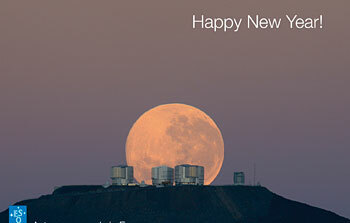 The newly released image, made with ESO's Wide Field Imager on the 2.2-m ESO/MPG Telescope at La Silla, covers 1 square degree on the sky and could therefore contain four times the full Moon. 20 December 2006: Nature has again thrown astronomers for a loop. Just when they thought they understood how gamma-ray bursts formed, they have uncovered what appears to be evidence for a new kind of cosmic explosion. These seem to arise when a newly born black hole swallows most of the matter from its doomed parent star. It Is Too Early To Be Santa's Sleigh, Isn't It? 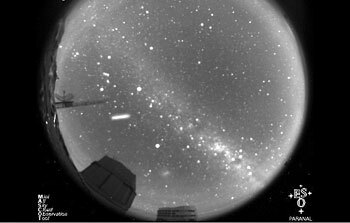 20 December 2006: Astronomers at ESO's frontline Paranal Observatory got a surprise on the morning of 18 December when looking at the observatory's all-sky camera, MASCOT. For about 45 minutes in the early morning, an object appeared first as a bright stripe then as a cloud that dissolved. 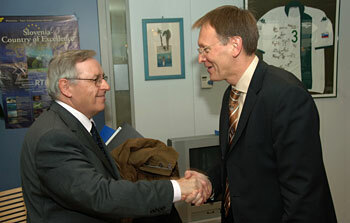 14 December 2006: Today, Janez Potočnik, European Commissioner for Science and Research received a statement of support for the European Charter for Researchers and the Code of Conduct for the Recruitment of Researchers from EIROforum. 11 December 2006: European astronomy has received a tremendous boost with the decision from ESO's governing body to proceed with detailed studies for the European Extremely Large Telescope. This study, with a budget of 57 million euro, will make it possible to start, in three years time, the construction of an optical/infrared telescope with a diameter around 40m that will revolutionise ground-based astronomy. 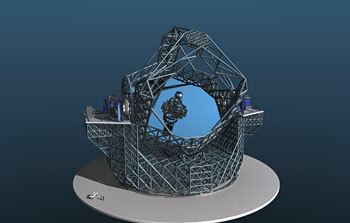 The chosen design is based on a revolutionary concept specially developed for a telescope of this size. 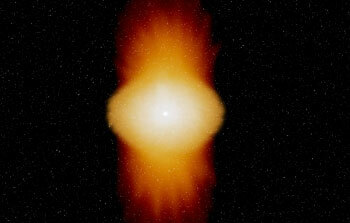 Do Galaxies Follow Darwinian Evolution? 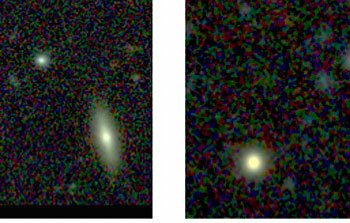 6 December 2006: Using VIMOS on ESO's Very Large Telescope, a team of French and Italian astronomers have shown the strong influence the environment exerts on the way galaxies form and evolve. The scientists have for the first time charted remote parts of the Universe, showing that the distribution of galaxies has considerably evolved with time, depending on the galaxies' immediate surroundings. 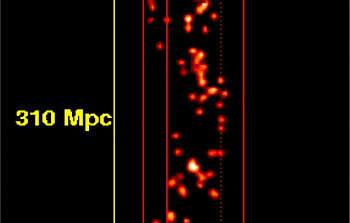 This surprising discovery poses new challenges for theories of the formation and evolution of galaxies. 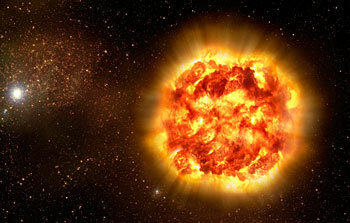 30 November 2006: Astronomers are reporting remarkable new findings that shed light on a decade-long debate about one kind of supernovae, the explosions that mark a star's final demise: does the star die in a slow burn or with a fast bang? From their observations, the scientists find that the matter ejected by the explosion shows significant peripheral asymmetry but a nearly spherical interior, most likely implying that the explosion finally propagates at supersonic speed. 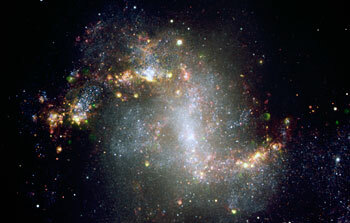 23 November 2006: The captivating appearance of this image of the starburst galaxy NGC 1313, taken with the FORS instrument at ESO's Very Large Telescope, belies its inner turmoil. The dense clustering of bright stars and gas in its arms, a sign of an ongoing boom of star births, shows a mere glimpse of the rough times it has seen. Probing ever deeper into the heart of the galaxy, astronomers have revealed many enigmas that continue to defy our understanding. 12 November 2006: ESO and the European Association for Astronomy Education are launching today the 2007 edition of 'Catch a Star! ', their international astronomy competition for school students. Now in its fifth year, the competition offers students the chance to win a once-in-a-lifetime trip to ESO's flagship observatory in Chile, as well as many other prizes. 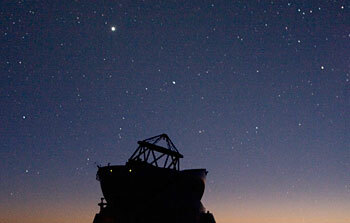 Students are invited to 'become astronomers' and embark on a journey to explore the Universe. 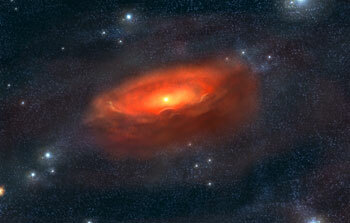 7 November 2006: A large survey, made with ESO's VLT, has shed light on our Galaxy's ancestry. After determining the chemical composition of over 2000 stars in four of the nearest dwarf galaxies to our own, astronomers have demonstrated fundamental differences in their make-up, casting doubt on the theory that these diminutive galaxies could ever have formed the building blocks of our Milky Way Galaxy. 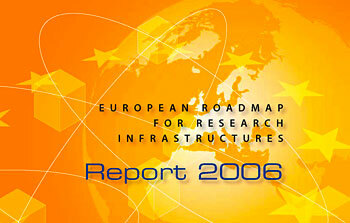 22 October 2006: In its first Roadmap, the European Strategy Forum on Research Infrastructures (ESFRI) choose the European Extremely Large Telescope (ELT), for which ESO is presently developing a Reference Design, as one of the large scale projects to be conducted in astronomy, and the only one in optical astronomy. The aim of the ELT project is to build before the end of the next decade an optical/near-infrared telescope with a diameter in the 30-60m range. 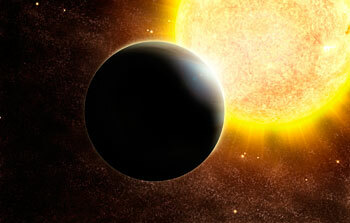 19 October 2006: Astronomers have detected a new faint companion to the star HD 3651, already known to host a planet. This companion, a brown dwarf, is the faintest known companion of an exoplanet host star imaged directly and one of the faintest T dwarfs detected in the Solar neighbourhood so far. 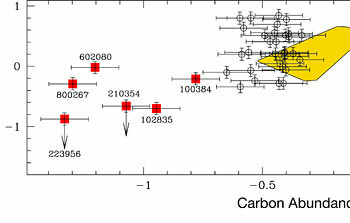 The detection yields important information on the conditions under which planets form. 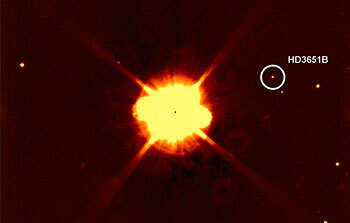 4 October 2006: Using ESO's Very Large Telescope, astronomers have confirmed the extrasolar planet status of two of the 16 candidates discovered by the NASA/ESA Hubble Space Telescope. One of the two confirmed exoplanets has a mass a little below 10 Jupiter masses, while the other is less than 3.8 Jupiter masses. 2 October 2006: Astronomers have found possible proofs of stellar vampirism in the globular cluster 47 Tucanae. Using ESO's Very Large Telescope, they found that some hot, bright, and apparently young stars in the cluster present less carbon and oxygen than the majority of their sisters. 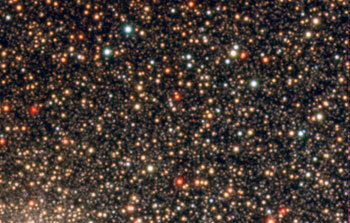 This indicates that these few stars likely formed by taking their material from another star. 28 September 2006: With the VISIR instrument on ESO's Very Large Telescope, astronomers have mapped the disc around a star more massive than the Sun. The very extended and flared disc most likely contains enough gas and dust to spawn planets. It appears as a precursor of debris discs such as the one around Vega-like stars and thus provides the rare opportunity to witness the conditions prevailing prior to or during planet formation. To Be or Not to Be: Is It All About Spinning? 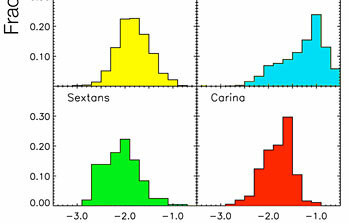 20 September 2006: Thanks to the unique possibilities offered by ESO's Very Large Telescope Interferometer (VLTI), astronomers have solved a 140-year-old mystery concerning active hot stars. They indeed show that the star Alpha Arae is spinning almost on the verge of breaking and that its disc rotates the same way planets do around the Sun. 12 September 2006: Looking in detail at the composition of stars with ESO's VLT, astronomers are providing a fresh look at the history of our home galaxy, the Milky Way. They reveal that the central part of our Galaxy formed not only very quickly but also independently of the rest.